Friday 4. 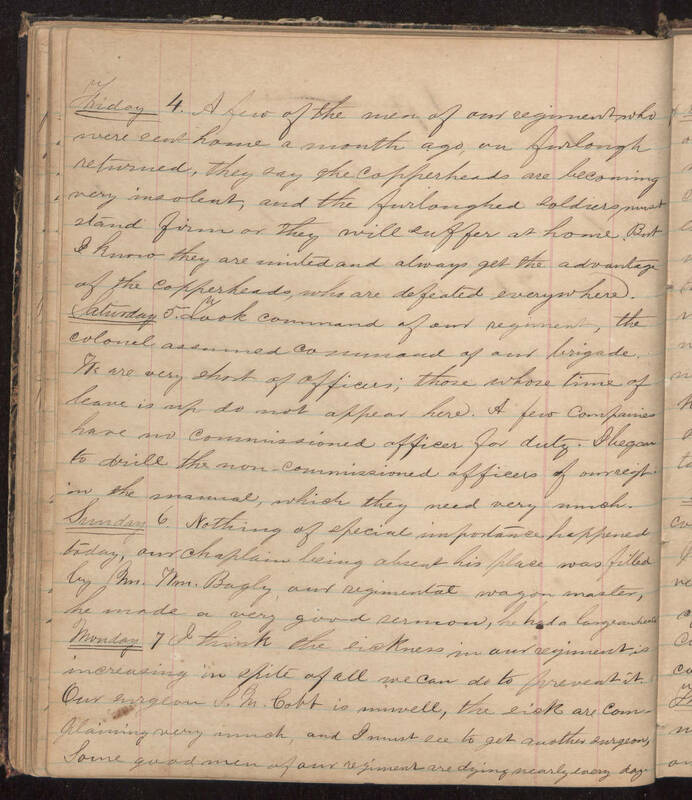 A few of the men of our regiment who were sent home a month ago, on furlough returned, they say the copperheads are becoming very insolent, and the furloughed soldiers must stand firm or they will suffer at home. But I know they are united and always get the advantage of the copperheads, who are defeated everywhere. Saturday 5. I took command of our regiment, the Colonel assumed command of our brigade. We are very short of officers; those whose time of leave is up do not appear here. A few companies have no commissioned officer for duty. I began to drill the non-commissioned officers of our regt. in the manual, which they need very much. Sunday 6. Nothing of special importance happened today, our Chaplain being absent his place was filled by Mr. Wm. Bagly, our regimental wagon master, he made a very good sermon, he had a large audience. Monday 7 I think the sickness in our regiment is increasing in spite of all we can do to prevent it. Our surgeon S. M. Cobb is unwell, the sick are complaining very much, and I must see to get another surgeon, Some good men of our regiment are dying nearly every day.